It’s designed for continuous high volume operation, and it’s looking for a home. Won’t you give shelter to the Creasematic Auto 50 – Automatic Programmable Air Suction Creaser? They’re cute and cuddly! 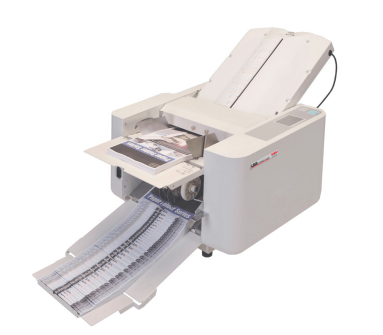 Well, maybe cuddly is stretching it a bit, but the Creasematic Auto 50 is quite lovable when you consider its capacity for sheets 5 3/4″ x 8 1/4″ to 19 1/2″ x 27 1/2″ on stock up to 130 lbs. It can crease up to 5,500 sheets per hour and makes up to 28 creases per sheet. You’ll choose those 28 creases from the 99 in its memory. Yep, this one’s a keeper – cute and smart! The Creasematic Auto 50 Automatic Programmable Air Suction Creaser is $15,499 at Lloyd’s. We’ll throw in free shipping and a gift with your purchase. For more information on the MBM Creasematic Auto 50 creaser or to place an order, please visit the Lloyd’s website.